After the visit by the Maine Pegmatite Workshop, Richard and I continued mining into the right hand corner of our advance. This effort required yet another advance. Like the prior advance completed in May, we were struck by the irregular nature of the upper contact. Just before the Workshop, we had drilled into a number of spaces in this area. 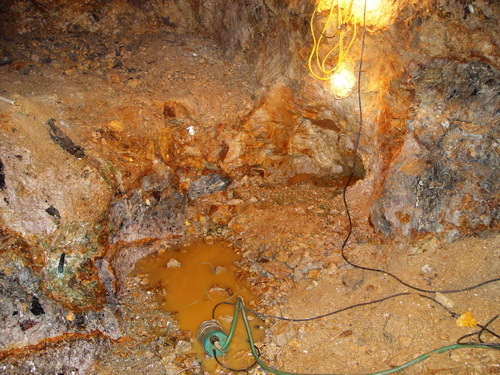 Unfortunately, as we removed the rock to work them, it became painfully evident that the mineralized zone was plunging fast. We could work this area but only with great difficulty. Our incentive to push on despite this obstacle was strong as it was clear that this corner was unusually well mineralized. 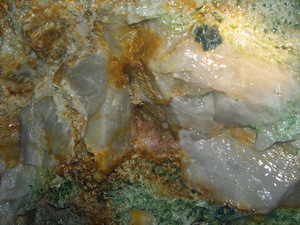 Here pink quartz was still showing up in small vugs as can be seen in the center of the image on the right. What we lacked in intelligence we back filled with dogged determination. On we pushed. Just to gain access to this area required us to back up 10 meters or so and lower the floor by a meter. This is real grunt work as there is no prospect of finding anything in the yards of rock that must be drilled, blasted and hauled out. 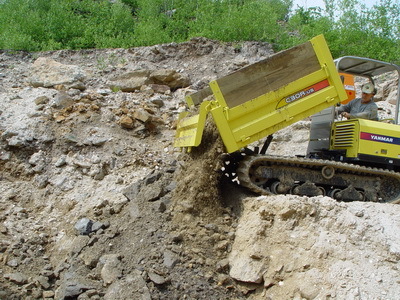 Haulage was becoming an increasingly difficult and time consuming task as the amount of rock to be removed escalated. Our JD skid steer was no longer adequate for the task. 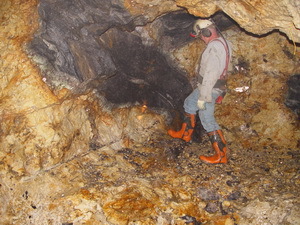 Many trips were required to travel out the muck from a single blast. In addition, as the JD would push against the muck pile, the engine would bog down and emit heavy noxious fumes generated by the incomplete fuel combustion in the engine. This was true even with the use of Mine-X catalytic converter on the skid steer. A re-think was required. To address the air quality issue, we again had Hodgdeon Well Drilling out to drill several 8" diameter holes in the ceiling of the Pink Room. With the use of 2 high speed fans drawing out the air, the air quality issue was solved. Blast fumes now also cleared much more rapidly. We had considered buying an LHD (Load Haul and Dump) machine. These are expensive and any that we could afford would be quite beyond their prime. I was afraid they would come with a heavy dose of maintenance issues. Since we are only a two man crew, there is no excess of manhours to devote to maintaining aged equipment even if we knew what we were doing. The solution we took was to buy a new Yanmar C30R all terrain carrier. This proved to be a good choice. Using our Kubota excavator and the Yanmar, yardage on each trip went from 1 to over 3. The Yanmar soon develop other roles. We used it extensively to haul equipment and as a drill platform. Now we no longer had to pile up muck in order to drill the higher holes as we did an advance. This was a big time saver. With our armamentarium thus enhanced, we were able to get into this interesting but very wet corner. Normally cleaning out a pocket does not lack for volunteers. This time , however, we would have to resort to a press gang. At the left, Richard who typically is more sensitive working conditions then I, is no doubt thinking he'll gladly cut bait on this one while management fishes. After he saw what was coming out he too was able to get into the heavy lifting of digging this pocket. In the image to the right pocket 3-07 can be seen going into the wall. Several very nice gem tourmaline sections were recovered from this areas. To our delight, the color was a decidedly lighter shade of green than the other tourmaline we had found in the Pink Room. Besides the green, some of the tourmaline had graded to shades of blue. Unfortunately, at Mount Mica, only near monochromatic crystals retain any integrity. There is a decided tendency to break along the color change boundaries. This pocket also yielded one very small piece of pink crystallized quartz. Though diminished, this occurrence was not completely extinguished. Gem tourmaline sections and small crystals from pocket 3 of 2007. We mined out the balance of the bench that can be seen in the image above right. 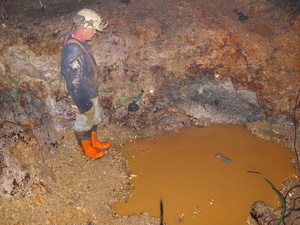 The mineralization continued unabated, but accessing this area, as we were doing, was difficult and would result in the loss of pocket material if it slipped into the water. 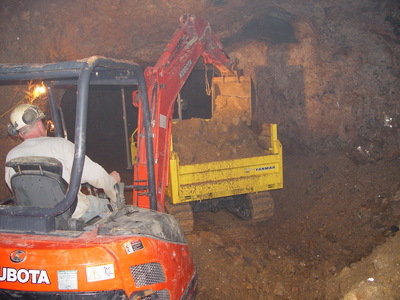 Our best bet would be to return to the deepest part of the mine and drive a new drift as deep as possible. At minimum, such an effort would be a couple of seasons work. As Frank Perham, the gifted observer of the silver lining, pointed out, I would not live long enough to dig up Mount Mica. That's not all bad...I guess. At this point, we decided to turn north and then west to explore the area just below the water filled upper pit and finish the pocket that the Workshop people had worked.